I have tested the VR output. It's low... hence why the ECM is throwing a CEL and a code for low battery voltage. However, I just read something on CycleElectric's website: "A stator that is shorted to ground may still produce full AC voltage from pin to pin. The problem with this is the rectifier changes the AC current to DC current and then uses the ground as one leg of the DC. When the stator shorts to ground the AC and DC get mixed together." Starting to look a bit like burnt stator syndrome? In my line of work we call this ask telling. You ask for help and tell what you think. Hoping to ask enough people so you finally get one to agree with your diag. That way when your wrong you can put some blame on others. I am not asking you for your personal opinion of the nature of my question, so if you don't mind, stick with the topic and stop diluting the subject. Your response was absolutely useless! Starting to look a bit like burnt stator syndrome? Does the primary fluid smell burnt? I just read something on CycleElectric's website: "A stator that is shorted to ground may still produce full AC voltage from pin to pin. The problem with this is the rectifier changes the AC current to DC current and then uses the ground as one leg of the DC. When the stator shorts to ground the AC and DC get mixed together. NOT applicable to YOUR specific charging system but i'll let you figure out why. damn near everytime you initiate a thread on here it ends up a keyboard slug-fest. unnecessary to snipe at Josh like that. your XB with its simple existing problem would have been diagnosed, repaired, tested and out the door of my shop in 1 hour. about 1/10th the time you've spent dicking around researching elsewhere and postulating on here. and for what it's worth you seem like the type that would use either Silkolene, Motul or Fuchs $18 a liter oil in your primary. just a hunch. if so get it the hell out of there or you WILL be replacing the stator in the near future. Is mesozoic another word for teabag ? Must be an engineer thing. It actually wasn't my opinion. Just stating the obvious of what is going on here. Im quite sure you are not ready for an opinion from me. LOL alright, I don't know why my threads piss people off. I don't think I'm being offensive, but maybe I am. I really don't know. In any case, I don't have an agenda and I'm not trying to make enemies. This is just how I write forum posts. I'm sorry if I offended anyone. The thing is, my XB12 is my daily driver and it's kind of an issue if it's not running. I'd like to get it back on the road ASAP. I don't know anyone I'd trust to work on my bike either. If I knew there was a good shop with great techs working there, I would certainly use them. I haven't drained the primary or dismantled any part of the bike yet (been away for work in Texas for about 2 weeks). I'll be sure to smell for burnt fluid, though. Speaking of fluids, I didn't run anything fancy in there. I've run Mobil1 15W50 before and the last oil change I switched to Belray Sport Trans fluid, which I think is made specifically for Sportster trannies (http://www.belray.com/sport-transmission-fluid). Maybe the Belray stuff was a mistake, I dunno. I thought it shifted nicer with it in there because the M1 made for some rough shifting when things got sporty. I'm just trying to figure out whether the stator is toast and order some parts to get the bike on the road ASAP. I'm not really familiar with the single phase stator deal, but the diagnostic manual says if any legs are grounded it's time to replace the stator. Does it make sense to replace the rotor while in there as well? Who makes a good stator? I see that the OEM Buell part has been replaced with 29900066. Not sure if Rick's, CycleElectric, or Accel make a better unit. In this thread, you posted pointless draw numbers to the FIFTH freaking decimal place, you are sniffing fluid and talking electrical theory that doesn't even apply to your bike. BUT you have not posted the most basic, easiest to check, and absolutely critical diagnostic info. I'm with Lunatic. You want to be in this pointless wormhole. Could have been fixed in 2 beers time. Good luck, I hope you can get back to riding your daily driver soon. LOL, sorry. I've Googled a fair bit, but I'm still not clear on how to test the VR. I should mention that I'm running a Compufire 55150 after my stock VR started over-voltaging and blowing headlamps (since Jan 2014). Someone on Badweb had used this model VR as an upgrade before me, so I'm happy to report that it has been working for many years reliably. 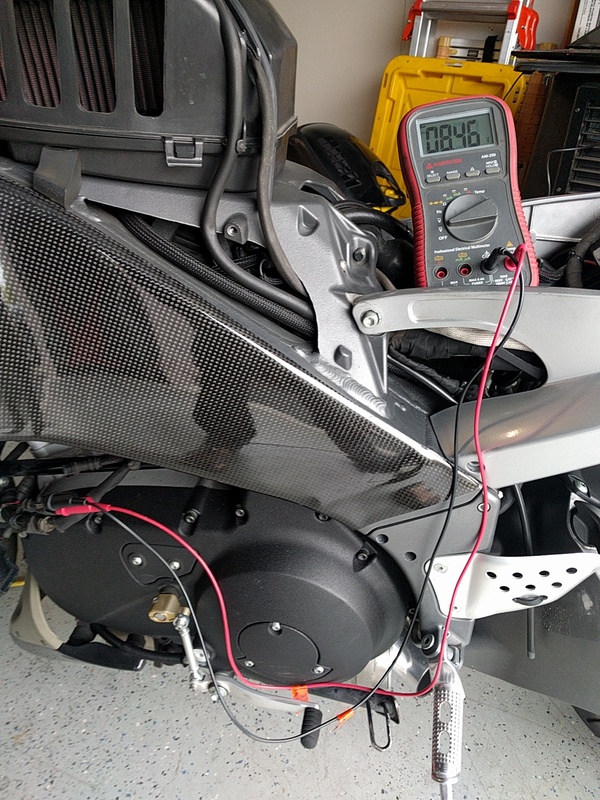 Anyway, to test the VR, I'm guessing that I should disconnect the VR feed back to the battery circuit and probe it while the bike is running, stator connection to the VR intact. Let me know if that's not right. I've probed the battery voltage while running and that's definitely reading low, like only 12.0V at idle. It does climb slightly with some RPM while running on the bike stand, but it's definitely not breaking into the high 12s. Edit: I tested the VR votlage output directly as I described above and the results weren't great. 8.5V. Last edited by Mesozoic; 02-13-2019 at 02:33 PM. had it ever occurred to you a week ago when you commenced this thread that perhaps you should have mentioned your addition of a NON-stock CompuFire VR to the charging system????? 1992-2007 buells ALL 3-phase charging system. 2008-2010 buell XB's all single-phase charging system. Y0302.5A8 suffix L19D...138 left in system....retail $119...available via any dealer. i've owned over 25 XB's to date and in all these years and all these miles only ever had 1 VR fail. they're quality robust units. order one....ditch the CompuFire gizmo....install it and ride...and end this thread.